Power InterchangeCampbell Heath off due to an injury. Eagles InterchangeCallum Sinclair off due to an injury. Cox with a dubious free kick from the centre bounce. Eagles begin where they left off with an inside fifty. The Worsfold Press effective in the first term. Glass having a field day off half back. Port only dangerous on the counter attack but making it look like hard work. Port scrambling for the last chance. Boy do they need one before the first break. Port must hang in here late in the first. Darling marks the kick inside 50 from Glass after a tidy piece of work by Four Quarters Waters. Darling misses the lot. Throw in near the left goal post. BEHIND EAGLES. Gaff sprays the set shot from 45m out. Sergeant Schulz in some distress near the boundary line for Port. Yet to receive his orders from the doc. GOAL POWER! Hartlett plays on from a free kick and puts the Power back in the contest with a smooth finish on the run from 40m. Boak snaps from hard up on the boundary. On the wrong foot he can only trouble the boundary umpire. Eagles clear again. Wines with some time 70m from goal but skews the kick off the instep and Eagles relieve yet again. Port dysfunctional across halfforward. Westhoff now loose in defence. GOAL EAGLES. Cripps atones for his earlier blemish. Kicks truly from 40m on a slight angle. Hinkley has something thinking to do. Eagles by 21. GOAL EAGLES! 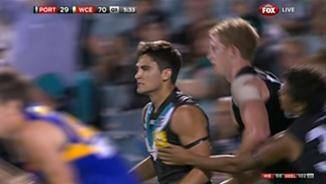 Waters marks at half back, the Eagles work it forward into the arms of Kennedy. From 55m out, JFK goes Bang! Eagles by 12. BEHIND EAGLES. Walked through by Cornes. Kerr and Cox looking ominous around the clearances. BEHIND EAGLES. Son of a gun Jacob Brennan is all alone directly in front 45m out. Shuey finds him too with a bullet pass. Port are a little rattled. Inside forward fifty for West Coast. The visitors looking more likely at this stage. BEHIND EAGLES. Cripps receives the handball from JuddBait Kennedy but his kick is high from 45m and offline. Port string together a chain of handpasses. Kornes kicks short inside fifty but the ball is chopped off by Dalziell. Eagles rebound. 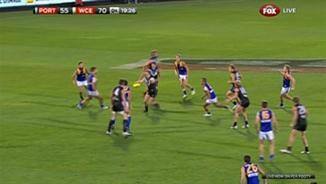 Gaff kicks long to Kennedy who outplays his opponent and marks fifteen metres from goal on a slight angle. Eagles with first blood. GOAL EAGLES. Kennedy slots the opener. We're away in the South Australian capital. Kick to kick on the outer wing. Wingard and Heath up and about early. Welcome to AAMI Stadium where the whitehot Power host the pre-season flag fancies West Coast. Has Ken Hinkley really transformed Port Adelaide in one short summer? Are the Eagles adrift in 2013? One late change for the Power. Jasper Pittard makes way for former Eagle Lewis Stevenson who was considered unlucky to miss by the Port hierarchy. Who would have thought preseason that this game would attract this much attention? Eagles should have the stronger bodies to prevail in a tight one, but try telling that to the full house of ferals. Welcome to AAMI Stadium for the Port Adelaide v West Coast Eagles Round 5 clash. 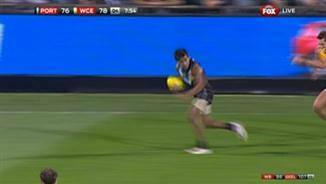 PORT ADELAIDE has unleashed a stunning late charge to overwhelm West Coast by five points on Saturday night at AAMI Stadium and remain unbeaten. West Coast, now wallowing at 1-4, led by 41 points midway through the third term but again was hobbled by poor goalkicking in the 12.12 (84) to 10.19 (79) loss. 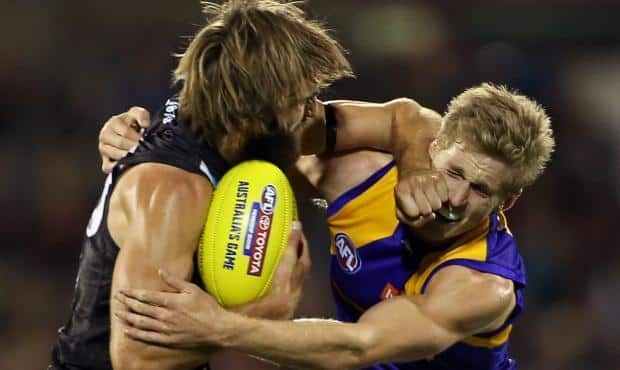 Conversely, the Power is 5-0, second on the ladder and looking assured of a spot in the top eight after a comeback that began in the 20th minute of the third term on Saturday night with emerging star Chad Wingard. 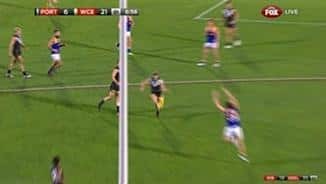 Wingard's goal after a dashing run and kick from pacey midfielder Jake Neade sparked a fightback as the Power kicked eight of the last nine goals of the game. Power coach Ken Hinkley said he had inherited a squad that refused to give up; a quality evident soon after his appointment at Alberton when he accompanied the team on a pre-season trip to the AIS training base in Milan. "From the day I went to Milan with this group, I've seen it," Hinkley said. "They're a young, combative, desperate group of young fellas. "I've had a group that is just willing to give everything they've got and I've seen that in pre-season in some of the tasks we set them." 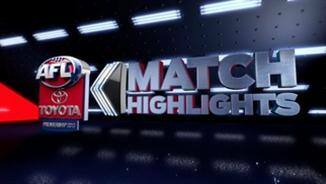 Wingard, Angus Monfries, captain Travis Boak and Hamish Hartlett each kicked two goals in the burst as West Coast struggled with just three players on the bench after the early substitution of Matt Priddis (concussion). The key onballer had his arms pinned in a Monfries tackle just minutes into the match and crashed face first into the turf. Worsfold said it was unknown whether the prolific ball-winner would be available to face the Western Bulldogs next weekend. "It's not my decision [whether he plays], that all depends on the medical assesments," he said. Boak's pair came within 90 seconds and gave Port the lead - for the first time in the game - 11 minutes into the last term. Eagle Bradd Dalziell replied to restore a two-point break for the visitors. But Port recruit Monfries capped a spirited comeback, running into an open goal in the 19th minute and his side held on. In the first term, West Coast kicked into a strong breeze but still managed its second-best first quarter of the season and a 22-point lead at quarter-time. After kicking 7.23 against Carlton last week, West Coast was again plagued by the yips in the second term, with the exception of Josh Kennedy. The elusive forward threaded four set shots, though teammates missed others as only inaccurate goal shooting - 7.13 - kept Port in it. The Power mustered only 2.5 in its dismal opening half, despite Kane Cornes gathering 15 touches to half-time in his 250th game. In a further blow, West Coast skipper Darren Glass was reported in the second term for a late shirtfront which stunned Port's Paul Stewart. Port's losing fate appeared sealed when Chris Masten goaled in the third to give West Coast a 41-point advantage. 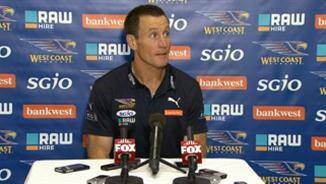 Eagles coach John Worsfold said his side became complacent after leading by such a margin late in the game. "We stopped putting the pressure on Port that we'd been putting on, and let them start running," Worsfold said. "We really just stopped the pressure game, I think." But Wingard sparked the tremendous comeback as the Eagles slumped to their fourth loss in five starts this season and Port coach Ken Hinkley's flawless start to his coaching career continued. Port Adelaide: Hartlett, Boak, Neade, Wingard, Cornes, O'Shea. West Coast: Selwood, Shuey, Brown, Gaff, Kennedy, Cox. Port Adelaide: Pittard (general soreness) replaced in selected side by Lewis Stevenson. 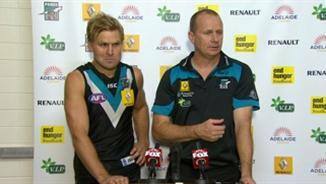 Port Adelaide: Robbie Gray replaced Jackson Trengove in the third quarter. West Coast: Jamie Cripps replaced Matthew Priddis in the first quarter. 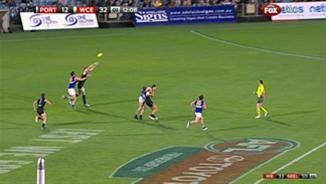 Reports: Darren Glass by umpire Pannell for rough conduct against Port Adelaide's Paul Stewart in the second quarter.